Looking for a great, classic weeknight dinner option that the whole family will love? This Ground Beef Stroganoff recipe is ready in less than 30 minutes, made from scratch, and is hearty, satisfying and delicious! 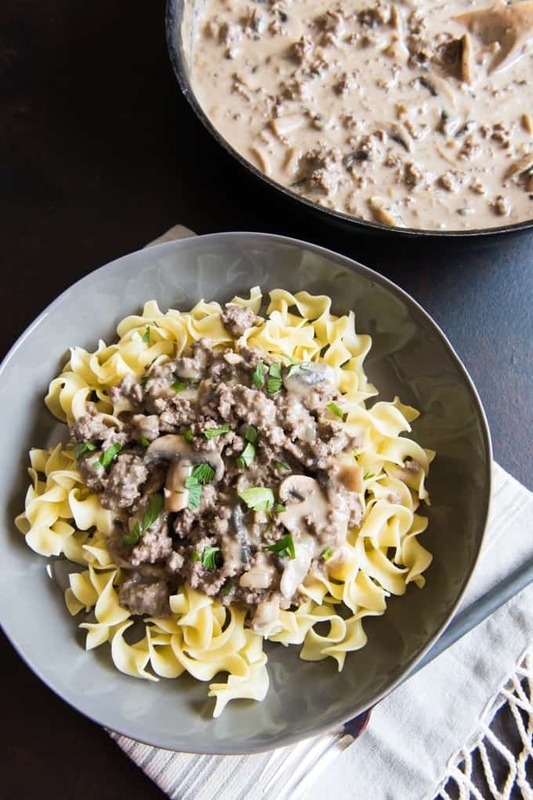 While it might not win any prizes for beauty, everybody asks for second-helpings when I make this ground beef stroganoff recipe for dinner. 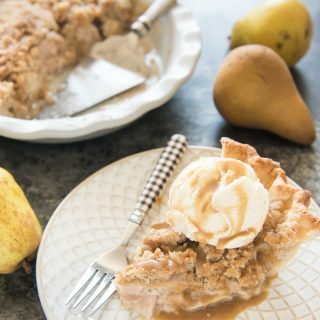 It’s a family favorite and one of our go-to meals, especially as the weather starts to cool down, because it’s so warm and comforting! 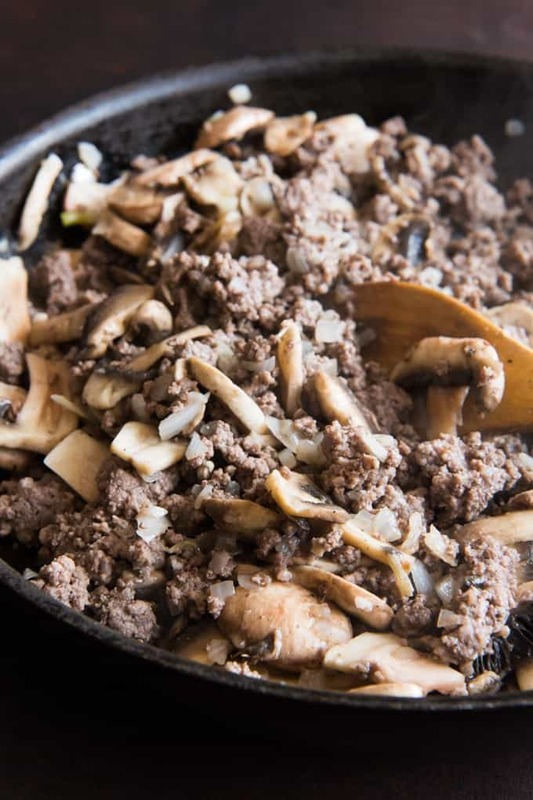 This savory, creamy dish of mushrooms, onions, and browned, ground beef served over hot buttered egg noodles hails from Russia and is simple, hearty, comforting fare that is quick and easy to pull together for a weeknight meal that the whole family will enjoy. 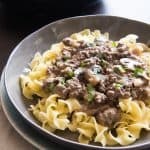 The homemade sauce is made from scratch with fresh ingredients and it is the best ground beef stroganoff recipe I personally have ever come across. I didn’t grow up in a household where we ate beef stroganoff, at least not that I can remember. But for people who did, it seems like most of them have memories of stroganoff versions made with cream of mushroom soup. 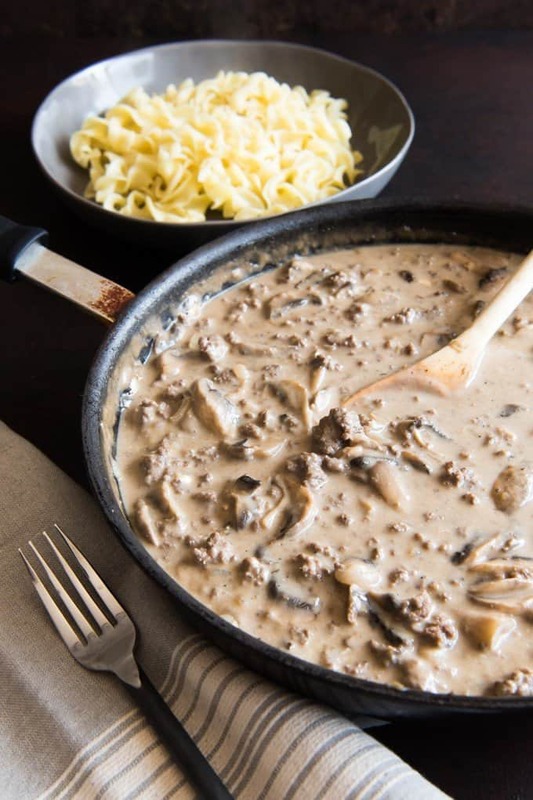 I make this ground beef stroganoff recipe without cream of mushroom soup mostly because it’s hardly any extra work to make it from scratch when all it takes is chopping a handful of mushrooms and whisking together beef broth, milk and flour. It might seem like a lot of mushrooms in the recipe, but since they cook down so much, it really seems necessary to me if you want mushrooms in each bite of stroganoff, like I do. The mushrooms are my favorite part! 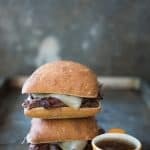 Plus, they help the meal stretch a little farther without as much meat and mushrooms contribute as much savory flavor to the dish as the beef broth, in my opinion. 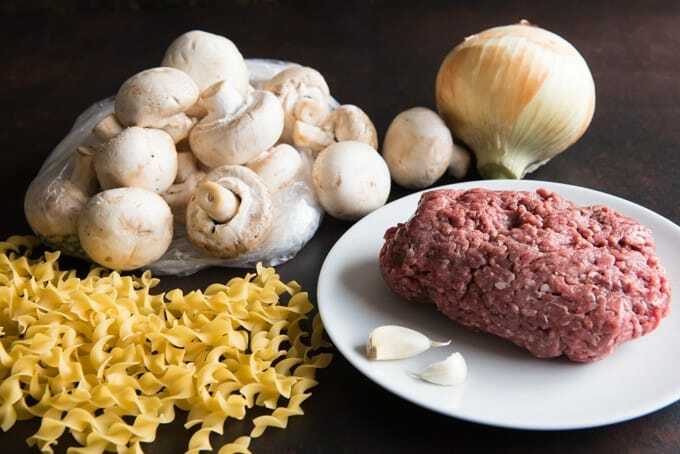 Start by browning ground beef, onions, and garlic, then adding the mushrooms and cooking long enough for them to brown a bit as well. Add the cream cheese to the browned meat and let it melt, stirring it to coat the meat before adding the beef broth and milk with a little flour whisked in to create a slurry. The sauce isn’t intended to be very thick. 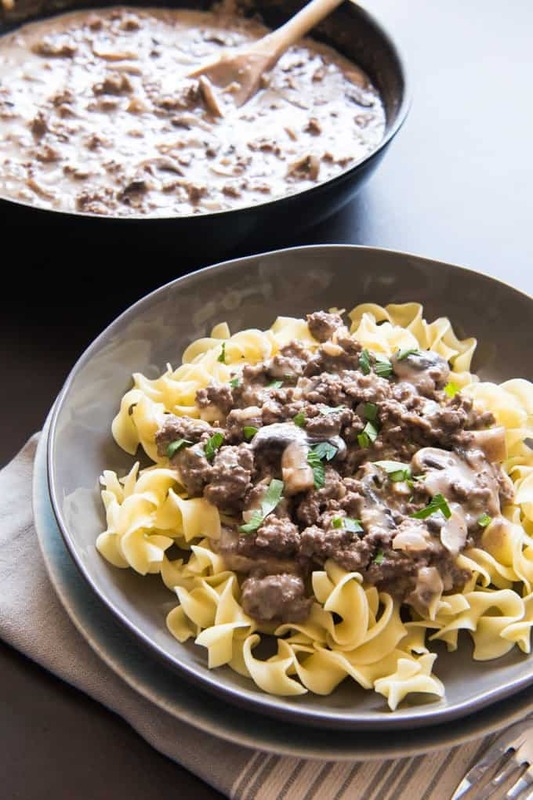 It’s more of a silky sauce that should coat each bite and combines well with the buttered egg noodles that we traditionally serve beef stroganoff with. It’s really this fantastic sauce that makes this the best beef stroganoff recipe I’ve ever tried. 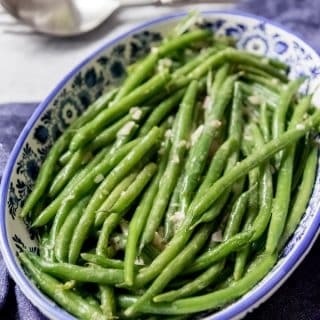 I almost always serve this with a big bowl of steamed broccoli on the side. 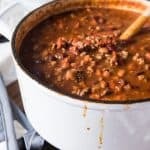 I always have a few pounds of ground beef in the freezer and it’s so easy to pull it out and thaw and get dinner going. I don’t have to bother cutting up the meat for my girls when we sit down to eat at the dinner table. Not a big deal, really, and I do it with other foods, but sometimes I feel lazy. Ground beef is easier. I honestly just prefer it! While I have had (and made) beef stroganoff with both steak and ground beef, it’s the hamburger stroganoff version I always come back to. I know that a classic beef stroganoff recipe typically calls for thin strips of steak, and maybe it “elevates” it a bit, but I’m not claiming this to be a classic or fancy recipe. I’m only claiming that it tastes delicious. Take care with the addition of sour cream at the end. Sour cream can curdle if boiled, especially if you are using a reduced fat version, so be sure not to add it to the sauce until right at the end of cooking after removing the pan from the heat. There will be plenty of residual heat in the sauce to thicken everything up and incorporate the sour cream. Many people like the addition of Worcestershire sauce to beef stroganoff. I have done it both ways, but think I prefer it without. If you want to add some, though, I recommend using 1 tablespoon, added with the broth. I also always use lots and lots of mushrooms in my easy beef stroganoff recipe because they are my favorite and most stroganoff recipes leave me wanting more! 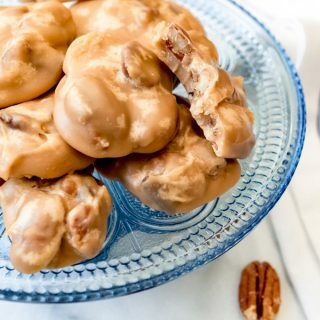 My version is adapted from one of my favorite bloggers, Mel from Mel’s Kitchen Cafe, whose stroganoff recipe instantly became my favorite when I tried it. The only changes I have made over the years were to increase the garlic and double the amount of mushrooms. Did you grow up eating beef stroganoff in your weeknight meal rotation? Looking for a great, classic weeknight dinner option that the whole family will love? This Ground Beef Stroganoff recipe is ready in less than 30 minutes, made from scratch without cream of mushroom soup, and is hearty, satisfying and delicious! Add the ground beef, onion, and minced garlic to a large skillet set over medium-high heat on the stove and season with the salt and pepper. Cook, stirring occasionally, until the meat is almost browned but still slightly pink and the onions have begun to soften, about 5 minutes. Drain any excess grease from the pan. Add the sliced mushrooms to the ground beef and onions and continue cooking for another 5 minutes or so, until the mushrooms are softened and brown and the meat is fully cooked. Add the cream cheese to the cooked meat and mushrooms and let it sit for 1-2 minutes to melt somewhat before stirring it into the meat mixture. While the cream cheese melts, combine the beef broth and milk in a separate bowl and whisk in the flour until no lumps remain. After stirring in the melted cream cheese, pour the beef broth/milk/flour slurry into the pan with the meat and mushrooms and cook for 3-4 minutes, stirring occasionally, until slightly thickened and bubbling. Remove from the heat and stir in the sour cream. Season with additional salt and pepper, to taste. Serve over hot buttered egg noodles, sprinkled with freshly chopped parsley, if desired. If you want to use Worchestershire sauce, I recommend adding 1 tablespoon along with the broth and milk. Recipe adapted from Mel's Kitchen Cafe. I love creamy, warm pasta dishes like this! They make me want to grab a blanket and eat it in a bowl on the couch. It sounds especially good now that the weather is getting a little chillier here– I’m going to have to hit the gym more often to make up for all the extra pasta I’ll be devouring! I didn’t grow up in a stroganoff eating household either, but it’s one of my husband’s favorites. I’ve been searching for a long time for a recipe that appeals to both of us and this one is perfect – especially with those extra mushrooms! It makes ALL the difference! Thanks, Mackenzie! I agree! I can never have too many mushrooms! Looks like a great, easy weeknight dinner! 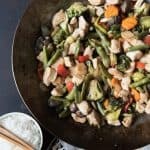 I love how easy and simple this recipe is, making it perfect for a weeknight meal! It is just comfort food on a plate, and I can’t wait for cold weather, when all I want is a meal of this! Can’t wait to try this! This is the perfect weeknight dinner for when the nights start to get chilly. 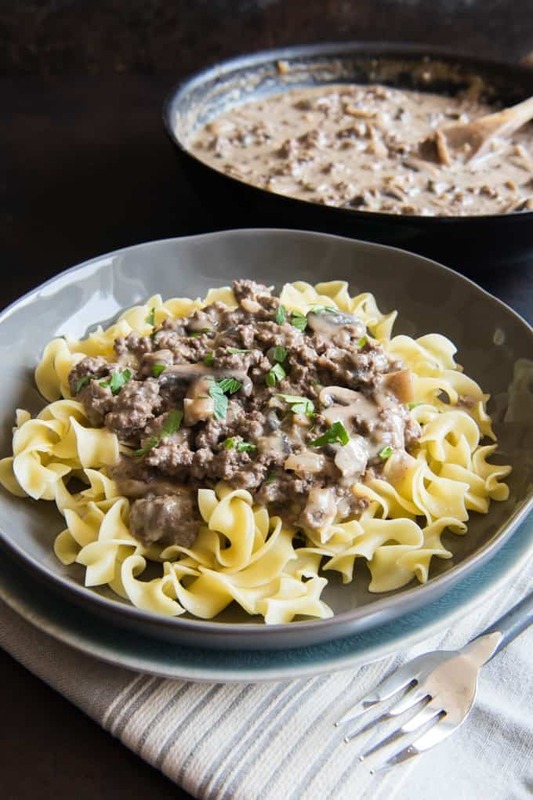 I love making stroganoff with ground beef; it’s just so convenient! Your sauce looks especially creamy and delicious with those fluffy egg noodles. 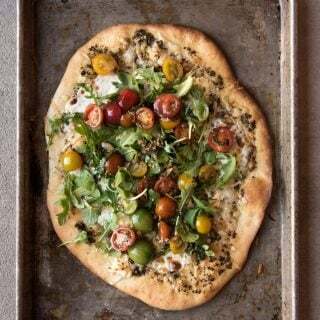 I can get excited about the cooler weather coming with dishes like these on the menu! You had me at double the mushrooms! They are probably my favorite part! We made this for dinner tonight. So, so good! Dave came in as I was chopping mushrooms and said something like that’s a crazy amount of mushrooms, there’s no way you’ll use all those. But I did, and it was delicious. Lol – thanks, Deborah! No such thing as too many mushrooms when it comes to stroganoff! They really do cook down a lot. 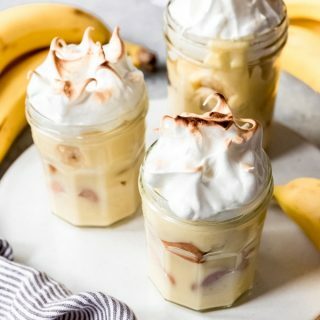 Here is a good way to explain the recipe with photography. 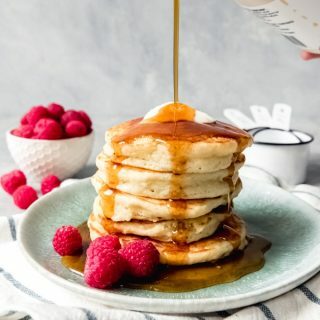 it looks good and tasty. Made this today and it was a surefire hit! 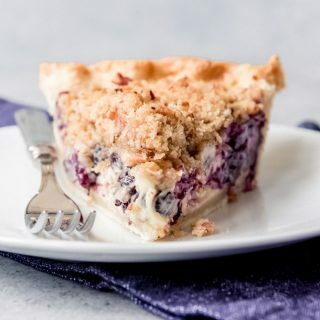 This is one of my absolute favorite recipes. My husband really likes it too. It only takes minutes to put together but tastes as good as something you’d eat at a restaurant. Thanks for posting it! This came out FANTASTIC!!! I did tweak it a bit for my personal taste. I added diced green peppers while frying up the ground beef and double the cream cheese. I love the extra mushrooms. 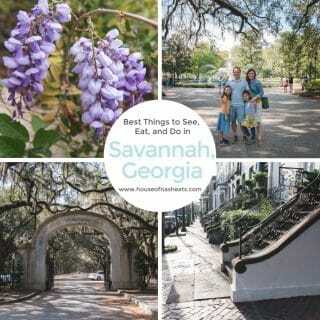 Definitely a go to recipe for stroganoff! Those are great adaptations! The green peppers make me think it might seem like a cross between stroganoff and philly cheesesteak? Sounds yummy!